POLITICAL TIDBITS: President Duterte's plea for six-months' extension of war vs. illegal drugs and his pledge to award P200,000 to each law-enforcer who gains recognition for successful campaign could spawn more slayings and rights violations. 18 UN investigators originally scheduled to look into rights issue here Sept. 28-29, but reports now say they'll all meet in Geneva instead---even as Mr. Duterte had already scheduled state visit to Vietnam same time. What's going on? President Duterte's plea for six-months' extension of war vs. illegal drugs and his pledge to award P200,000 to each law-enforcer who gains recognition for successful campaign could spawn more slayings and rights violations. 18 UN investigators originally scheduled to look into rights issue here Sept. 28-29, but reports now say they'll all meet in Geneva instead---even as Mr. Duterte had already scheduled state visit to Vietnam same time. What's going on? Early in her presidency Gloria Macapagal Arroyo was invited to address the conference of the Organization of American States in Mexico City and my husband and I joined the group of Speaker Jose de Venecia to attend it. The drug situation in Mexico had by then worsened, so much so that the hotel we were staying in did not allow us foreigners to ride just any taxi within the city environs---it had to be vehicles either owned by the hotel or whose company it had links with. In our desire to see some famous towns not too far from Mexico City, however, we defied this informal arrangement with the hotel and joined public tours to Puebla de los Angeles and other towns. We were, in effect, gambling with our lives then. President Duterte’s major contribution to the country at this moment has been to make us all aware of just how huge the drug problem has become. Experts in the anti-illegal drug campaign estimate that virtually 90 percent of our barangays have been infiltrated by illegal drugs. The basis of his strength as a leader, with his acceptance rating said to be at 91%, stems from his tough campaign against illegal drugs and the realization that if nothing is done about this problem, we could end up like Mexico in those years or Colombia. The campaign against illegal drugs, however, has spawned its own problems, principally some violation of human rights in the eagerness to put an end to the terrible situation the nation is in. Rights advocates have raised the alarm bells about extra judicial killings (which have become notorious with its acronym---EJK) and the possibility that police forces have been too quick to eliminate perceived drug addicts and pushers, to make their job easier. It is a tough balancing act indeed for the law-enforcement agencies. Yesterday's news, however, that President Duterte will give a financial reward of P200,000 for each law enforcer who has received an award or recognition for a successful anti-crime operation (read: anti-illegal drug campaign) will only complicate the problem of human rights. This is because this move of Mr. Duterte, even if it may be well-intentioned, could spur lawmen to even be quicker to eliminate perceived drug agents or ushers---just to qualify for that rich monetary reward. Ang laking pera! Moreover, I don’t see why the President would seek an extension of another six months to carry out his campaign promise to eliminate the drug problem within the first six months of his incumbency, as otherwise he would resign from office. Why doesn’t he just carry on the campaign without having to set deadlines. It’s obvious that this problem cannot be solved by deadlines. In fact, it could even aggravate the killings that already the world and various international institutions are protesting, as the lawmen would be under tremendous pressure to move against the drug world through fair and foul means WITHIN THE GIVEN DEADLINE. Setting deadlines could only aggravate the problem, just as the financial reward system would. Please just continue to work on this most serious problem, Mr. President, and update the Filipino people periodically of its progress, and yes, please curb the abuses of the law-enforcers. The drug problem seems to have engulfed us as a nation, both literally and figuratively. At the hearings in the House of Representatives over the past few days, the effect on us viewers was most surreal---it was like watching a modern-day version of the old Al Capone movies, when power and political influence reigned and sought to defeat the federal government’s campaign vs. drugs and other high crimes. Doubtless many citizens had mixed feelings about seeing the biggest drug lords in our country swear (!) to tell the truth and nothing but the truth about former Justice Secretary and now Sen. Leila de Lima---how she once lorded it over them and was on the receiving end of many millions of pesos in payola, in return for indulging their unbelievably luxurious lifestyles inside the New Bilibid Prison. This is not to say that the allegations raised by the convicted drug lords were not credible. The struggle for supremacy in the drug trafficking inside the NBP and how the then Justice Secretary wielded the power to decide which drug lord the fates would smile upon---simply by moving the less favored to the NBI stockade and leaving the NBP kingdom to the most favored one, Jaybee Sebastian---is entirely believable. In return, she was accused of having received staggering amounts of money that supposedly went to fund her senatorial campaign. Inasmuch as the Liberal Party needed to secure the victory of its candidates in the May 2016 elections so that it would be protected from future prosecution, it's entirely possible, too, that much of the drug-sourced funds from the NBP drug lords also rained down on other LP candidates. The inevitable queries: Just how much of those drug funds was former President Noynoy Aquino aware of? Did he know of the dalliance between his Justice Secretary and the prominent convicts? There's said to be a photo showing Jaybee Sebastian and then President Pinoy together. Just how much funds went into LP campaign coffers remains to be seen. What is clear is that some politicians were blinded by ambition and self-preservation, so that there was little qualms about dirtying their hands with drug money. It is truly a sad commentary about our nation and the question in the minds of many citizens is, how did we get into this terrible state of affairs? 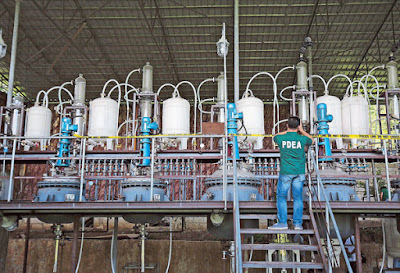 Take the recent photo of a spanking-shiny "factory" in Arayat, Pampanga that appeared in several newspapers. It was confirmed to be a shabu factory that services the needs of Central Luzon. Reports say there's an even bigger such laboratory in Angeles City. The question is, weren't the officials of both localities fully aware of the activities of these huge shabu labs? Who were in cahoots with them? These officials have to be investigated by the proper authorities as they could just have been turning a blind eye to what was going on in their areas. Then too, how many more shabu factories are there around the country? Then the related question: what happens to all the illegal drugs that land in the law-enforcers’ hands? Are they disposed of properly, to ensure that these would no longer be a menace to society, or do they just change hands and end up peddled among users once again? Mr. Duterte has encouraged UN agencies that have been attacking his all-out war on illegal drugs to come and investigate on their own perceived abuses in human rights here. As a result, eighteen investigators from the UN Committee on Economic, Social and Cultural Right have been scheduled to arrive this Wednesday. The President's invite was doubtless welcomed around the world and it projects a good image for our country and leader---if he could hold his sharp tongue and let them be. But wait a minute: fresh news release by the UN Human Rights (UNHR) indicates that the UN reviewers won't come here after all. Instead they'll gather in Geneva, even as Mr. Duterte has already made plans for a state visit to Vietnam on those days---obviously so that he needn't meet them here. The conflicting reports on the UN staff's visit is awfully confusing even to the administration, and speculations naturally are flying thick. Could it be that UN Chief Ban-Ki-Moon has deemed it useless to send them here, and that they could dig up something more meaningful in Geneva? Let's wait for more developments.